This webtoon tells the story of an office worker who hates her misogynistic boss and wishes he would die but then he actually does, after getting hit by a truck. The main character wakes up to discover it was just a dream but then quickly realises after arriving at work that the day is playing out exactly the same as it did in her dream. In order to get over the day constantly repeating, she has to try and prevent her boss from dying. Baek Jin Sang (Kang Ji-hwan) is the director of chicken marketing company in the play, a person who received a scholarship for four years at the prestigious university and joined the chicken company as chief. Despite his great resume, he is he’s known for within his company is his terrible personality. He’s verbally abusive with absolutely no filter, and he’s the type of manager everyone has fantasized about killing at least once. Unfortunately for him, his colleagues’ fantasies come to fruition and his character dies at the beginning of the show, only to be caught in a time rift that keeps bringing him back to life. Lee Luda ( Baek Jin-hee ) is a long-suffering subordinate to Baek Jin Sang’s tyrannical manager, who gets caught up in her manager’s constant battle for survival. (Gong Myung) is a marketing manager of the chicken company. He turns heads in the office for his good looks but also his wackiness, and he’s the type to force his subordinates into games of chance to determine who goes on assignments. Nobody can complain about him though, because he’s the nephew of the company’s president. Kang Ji Kwan confirmed to star in KBS2 drama Happy If You Died/ Happy to Die. Baek Jin Hee may be appearing in a new drama quite soon. Based on a webtoon, “Happier if You Died” is about Manager Lee Luda and her superior Chief Baek Jin Sang, as they leap through time, start a new life, and deal with strange incidents. Actor Kang Ji Hwan is currently in talks for the role of Chief Baek Jin Sang. The drama will be directed by Lee Eun Jin, who previously worked on “Hope for Dating,” “Trot Lovers,” and “Sassy Go Go.” It is slated to air in September. On August 31, J Wide Company confirmed, "It's true Baek Jin Hee has been offered the leading role Lee Ruda of the new KBS 2TV drama 'Can Die Happy'." She's currently reviewing the offer. 'Can Die Happy' (working title) is a drama version of the webtoon of the same title. Actor Kang Ji Hwan has been offered to play the male lead. The new drama is scheduled to air in November. KBS is casting for its upcoming drama Happy to Die, and offers are out to Kang Ji-hwan (Children of a Lesser God) and Baek Jin-hee (Let’s Eat 3) to star in the time-bendy webtoon adaptation. Though the time-bendy aspect might seem like an overused concept at this point, especially with Familiar Wife airing over on tvN, the synopsis sounds quite different in tone, and just fresh enough for those of us with genre-fatigue. Kang Ji-hwan is up to play a marketing manager at a fried chicken company, who graduated from an elite university at the top of his class. He might have a great resume, but what he’s known for within his company is his terrible personality. He’s verbally abusive with absolutely no filter, and he’s the type of manager everyone has fantasized about killing at least once. Unfortunately for him, his colleagues’ fantasies come to fruition and his character dies at the beginning of the show, only to be caught in a time rift that keeps bringing him back to life. If she accepts, Baek Jin-hee will play a long-suffering subordinate to Kang Ji-hwan’s tyrannical manager, who gets caught up in her manager’s constant battle for survival. The reports don’t elaborate on whether, or how, she gets stuck in this time rift alongside him, but she plays an important role in stopping Kang Ji-hwan’s character’s death on a daily basis. Which sounds exhausting, but great fun for us as viewers, since we get to witness Kang Ji-hwan’s character painfully transform into a decent human being. Nothing like a good sci-fi comeuppance for everyone’s worst workplace nightmare. Actor Gong Myung is considering to appear in drama Happy If You Died. He is in the process of positively reviewing the offer. A source from the drama department revealed that Gong Myung is in talks for KBS’s upcoming Wednesday-Thursday drama “Happy If You Died” (working title). Baek Jin Hee and Kang Ji Hwan are also in talks. It has been a year since Gong Myung was in a drama. His last drama series was “Revolutionary Love.” He is currently working on JTBC’s drama special “The Essence Of Happiness” (working title). Gong Myung will play the role of Kang Jun Ho, the chief of the marketing department. All the women in the company look at him in awe when he walks down the hallway. He perfectly fits the phrase “Your body figure completes your fashion.” However, he is a handsome but quirky character. When the manager tries to pass an undesirable business trip to the staff, Kang Jun Ho suggests doing a lottery (including the manager) to pick the one who will go. No one dares to say anything to him because he is the nephew of the CEO. “Happy If You Died” is an office drama that tells the story of an evil manager and an assistant manager who tries to change him by leaping through time. It is based on the popular webtoon by the same name. It will portray the real lives of workers in Korea and refresh viewers by punching through the suffocating reality. The drama will be directed by Lee Eun Jin, who previously worked on “Hope For Dating.” “Trot Lovers,” “Sassy Go Go,” and “Neighborhood Lawyer Jo Deul Ho.” It is slated to air in late October. I was thinking that it’d been a long time since I’d seen Gong Myung in dramaland, but I realized it was because I cut out of Revolutionary Love so early that I could only remember him being in Bride of the Water God 2017. He’s been offered KBS’s new workplace drama Happy to Die, which sounds like a healthy dose of wish fulfillment for beleaguered office grunts, described as a refreshing burst of cider thrown at the frustrations of real life. It’s based on an award-winning webtoon about the fantastical time-bending journey that turns a terrible boss into a decent human being. Because we all know it takes serious magic to make that happen. Kang Ji-hwan (Children of a Lesser God) has been confirmed for the starring role as the boss everyone hates with a fiery passion and wishes an untimely death upon. They get their wish when the manager dies unexpectedly and then gets caught in some sort of time-loop where he keeps dying and being brought back to life. In the course of the time travel, he learns to stop being an abusive team leader and tyrant. I’m guessing that’s mostly due to the subordinate who keeps saving him from dying every day, which is the role that Baek Jin-hee (Let’s Eat 3) has been offered. Made me forgot what I wanted to type in annoyance. In Gyo- and Jin Lee Byung-Joon will appear in drama Happy If You Died. Office comedy expectations. Lee Byeong-joon's playing managing director, 'Lee Chul Su' and he is a long-term employee of the company, and he supports the 'tough' president. She plays a marketing contractor, Lee Jung - hwa, who is dreaming of a full - time job. KBS’s new Wednesday-Thursday drama “Happy If You Died” has revealed more actors who will join the cast! It has now been announced that Park Sol Mi, Ryu Hyun Kyung, In Gyo Jin, Lee Byung Joon, Kim Min Jae, Jo Han Chul, and Seo Jeong Yeon will join the cast. Park Sol Mi will take on the role of Yoo Shi Baek, the elite director of the company’s headquarters. She is a woman who looks soft and easy on the outside but who has strong leadership and charisma. Ryu Hyun Kyung is Choi Min Joo, the loving manager of the marketing team. In Gyo Jin and Lee Byung Joon will play high officials of the company. In Gyo Jin will be CEO Kang In Han, who desires to completely own the company by pleasing his father. Lee Byung Joon will play the role of director Na Chul Soo who assists Kang In Han. Kim Min Jae, Jo Han-cheol , Seo Jeong-yeon cast in drama Happy If You Died. The actress will play the role of Lee Luda, an outspoken assistant manager of a company. She will act alongside Kang Ji Hwan and strong supporting actors like In Gyo Jin and Park Sol Mi. 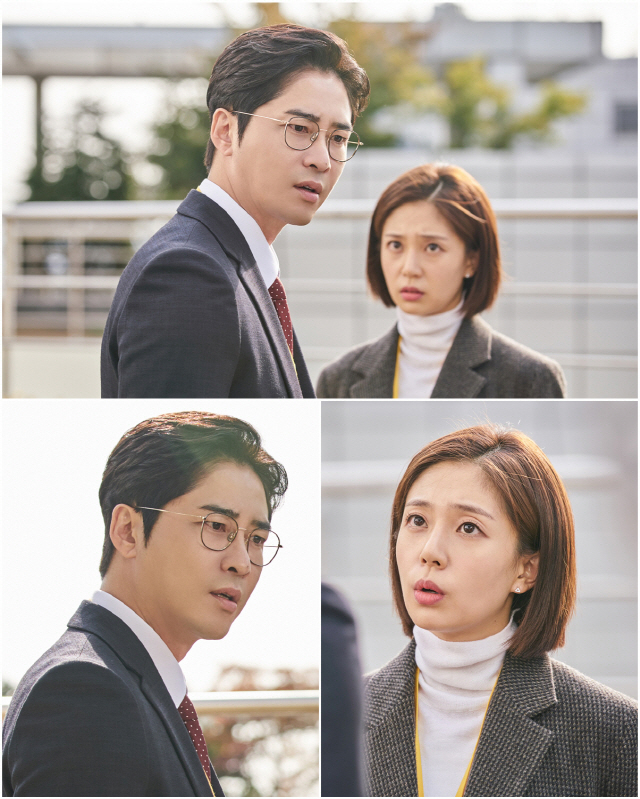 “Happy If You Died” will tell the story of “evil boss” Baek Jin Sang (played by Kang Ji Hwan) and assistant manager Lee Luda, who tries to transform him into a better person. Although Lee Luda wants a normal and quiet life, she fights against Baek Jin Sang, as she is not truly scared of him. The office life will arouse feelings of sympathy from most viewers, but the drama will also try to provide more satisfying and refreshing feelings. Baek Jin-Hee is cast in KBS2 drama series “Happy If You Died” (literal title) co-starring Kang Ji-Hwan. The drama series is based on webcomic “Jookeodo Joa” by Goldkiwisae. For the drama series, Baek Jin-Hee will play lead female character Lee Roo-Da. Her disliked boss is Baek Jin-Sang (Kang Ji-Hwan). One night, she dreams that her boss is hit by a car. “Happy If You Died” first airs November, 2018 in South Korea (takes over KBS2’s Wednesday and Thursday 10PM time slot after “The Ghost Detective“). the script is in! Just read the original webtoon and it is hilariously great. PRODUCTION H - behind OCN "Life on Mars" and KBS2 "School 2017", which are both good. Actor Gong myeong confirmed to star in drama Happy if You Died. This show is going to such a satisfying watch, in an admittedly sadistic way. KBS is gearing up for the premiere for its upcoming time-slip, workplace drama Happy to Die, and photos of the first script read with the cast have just been released. Kang Ji-hwan (Children of a Lesser God) and Baek Jin-hee (Let’s Eat 3) play our main leads, as a misogynistic boss-from-hell and his long-suffering subordinate, respectively. After reading the premise of Happy to Die, I checked out a few chapters of the original webtoon and found myself grinning with second-hand satisfaction at all the various ways Kang Ji-hwan’s character gets killed. I haven’t read beyond the first 10 chapters or so, but at least in the beginning of the story, Baek Jin-hee’s character is the only one aware of being stuck in a time loop. Every time her boss dies, she finds herself reliving that same day over and over again, and the only way she can make it to the next day is if she can stop Kang Ji-hwan from dying comically horrible deaths (I’m pretty sure he gets electrocuted by his keyboard at one point). KBS’s new Wednesday-Thursday drama has revealed its first glimpse of star Gong Myung in character! Based on the popular webtoon of the same name, the upcoming drama “Even If I Die” (literal translation) will tell the story of Baek Jin Sang (played by Kang Ji Hwan), the boss from hell, and Lee Luda (played by Baek Jin Hee), the assistant manager who tries to change him into a better person. Gong Myung will be playing the role of Kang Jun Ho, the head of the marketing department and the company’s most popular employee. Although Kang Jun Ho is the nephew of the CEO, he never lets his elite status at the company go to his head—as a friendly, down-to-earth guy, he gets along well with the other employees and gives off positive vibes wherever he goes. No wonder the employees want him dead.